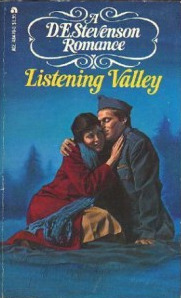 Just a couple of weeks ago I managed to buy an old copy of Listening Valley by D.E. Stevenson in Edinburgh, sadly it doesn’t have it’s dust jacket though. I can’t say I’m all that keen on the cover of the paperback above, but I suppose it’s better than nothing. The book begins with the Edinburgh childhood of Louise and Antonia Melville. On the surface they have a very comfortable upbringing, it would seem that money was no problem. But in truth they’re really emotionally neglected children, brought up by the nannie. They both have the same problem – they weren’t born a boy and both parents wanted a boy, particularly their father as his family home was a castle and he wanted to pass it on to a son. In disappointment he ended up selling the castle. Their mother was a bridge fiend and playing bridge seemed to take up all of her time. She was disappointed because she thought of her girls as being very dull compared with other children she met, but as she never took the time to get to know her daughters she had no idea of their real personalities at all. Inevitably both girls marry young, Tonia marries a man even older than her father is but he’s kind and wealthy and gives her some badly needed confidence, in wartime they move to London and experience the Blitz. Eventually the action moves back to Scotland where Tonia settles close to what had been her father’s country estate. But the war is still very much in evidence with an airfield very close by. Tonia’s home becomes a meeting place for young airmen who never knew when their number would be up. I thoroughly enjoyed this one, it has some truly ghastly characters in the shape of sponging relatives, I have a feeling that they crop up from time to time in Stevenson’s books, she must have been bothered by some I think! I bet they never read her books though. I’m still stuck in World War 2 but this time it’s a fictional book, The Slaves of Solitude by Patrick Hamilton was first published in 1947 and if you enjoy a World War 2 English setting then you’ll love this one. Miss Roach is a rather lonely woman in her late thirties, she’s a reader at a firm of publishers and like many people she has been bombed out of her home in London so she has taken up home in a suburban boarding house in Thames Lockdon (Henley-on-Thames) and she is having to commute into the city every day by train. The boarding house is populated by single people all older than Miss Roach, the women are of the genteel variety, but it’s Mr Thwaites who is a thorn in Miss Roach’s flesh. Thwaites is an elderly man who gets his kicks picking on Miss Roach at every opportunity, usually at meal times. He’s a bully and a buffoon and Miss Roach dreads mealtimes, but when an American serviceman comes into her life things seem to look up a bit. There seems to have been quite a fashion for books with a wartime boarding house setting, I suppose it was a new experience for strangers to be thrown together as they were and as such it was a rich source of copy. I have a confession to make – this was actually a re-read for me, but it was a long time before I realised that! It seems that I read it way back in 2011 and during this re-read I kept thinking I’m sure this must have been made into a film, because it seems so familiar. But at no point did I think I had already read it – until I got almost right to the end – honestly – what am I like?! Warpaint by Alicia Foster was first published in 2013. The setting is 1942, Bedfordshire where in a villa close to Bletchley Park there’s a small community of people who are working to compile Black propaganda to send to Germany, with the idea of demoralising the German population. Some of them draw cartoons of the Nazi leaders and others write letters which are sent to the parents of dead German soldiers, supposedly from their sons who are claiming to be alive and well and living in England, happily. Sam and Vivienne are a husband and wife working in the Black villa, with Sam being the head of operations, Charles and Frido are the others in the team. Frido is a ‘good’ German who is top of the Nazi’s most wanted list and knows all of the top Nazis so his knowledge and talents are invaluable. Meanwhile, in London The War Advisory Art Committee has been set up, there’s a small community of women artists who have been given commissions to draw and paint scenes which portray Britain in wartime and capture the atmosphere and reality. They must conjure up the bulldog spirit. Sir Kenneth Clark (Director of the National Gallery) has been given the job of getting the women to come up with the goods but he has passed the task on to Aubrey Smith, a much younger and inexperienced pen-pusher. As the whole war art idea came from Churchill it’s obvious that Clark wants to avoid the responsibility of the job as he has been having trouble getting any work out of the women. Like everyone else at that time, their lives are anything but normal and the reader is drawn into all the personal problems which have come about mainly because of the war. This book was right up my street, I loved the wartime setting which is inevitably tragic as all those ‘few’ were scrambling for their planes and all too often not coming back, as Dame Laura Knight was capturing the moments on canvas. It’s a thriller with lots of twists to keep you turning the pages. This book weaves a couple of actual people with fictional characters, not something which I’m terribly fond of but I think in this case it works well, despite the fact that I couldn’t stand Sir Kenneth Clark, especially after reading Alan Clark’s biography where it was a toss up as to which one was the most ghastly – father or son. Warpaint is Alicia Foster’s first novel and is very well written. She has a Ph.D in art history and teaches art students. Like all good books, this one piques your interest in the subject and urges you to go and do a bit of research of your own. Below are a couple of Laura Knight’s wartime paintings. You can see a lot more of her work here and here. Dame Laura Knight became the official artist at the Trials of Nazi war criminals in Nuremburg.